VooDoo Lounge Las Vegas is one of our favorite places in Sin City. Although it’s a dance club, we at Free Vegas Club Passes, don’t go there just for the dancing. 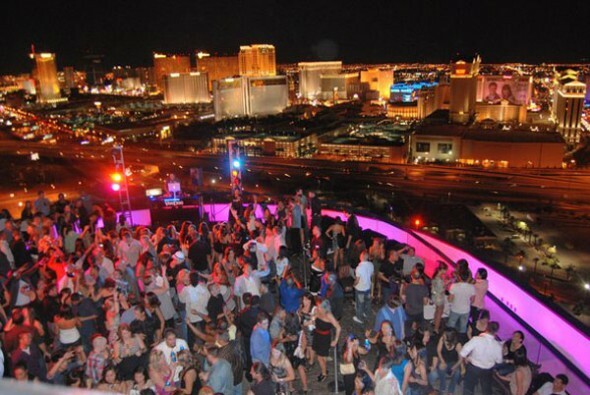 VooDoo Nightclub is located on the roof of the Rio facing The Strip, and from 51 stories high, the view is spectacular and makes it a perfect spot to enjoy bottle service. The main feature of this indoor/outdoor, double-decker nightclub is a grand 40,000 pound steel staircase that’s so massive, it had to be air-lifted into place when it was installed. It’s truly worth seeing, but you’ll spend more time staring at the striking views of The Strip than you will at the architecture beneath your feet. There is live music upstairs, ranging from rock to cover bands playing almost anything. Outside has a whole different vibe, with DJs usually playing popular dance music. There is no defined dance floor, so you can dance in the aisles, on the tables, or just in an open space on the patio. Living up to its name in its magical atmosphere, VooDoo Lounge Rio is truly an amazing place to relax and enjoy the warm night air. Check out VooDoo Lounge Las Vegas guest list options and ask us about special bottle service pricing below!